Oh Gawd… did I just type that? Still, someone is a marketing genius. Anyway… As you all know, I think that Vodka should be as neutral as possible (like Green Mark & Tito’s) unless it’s making a statement (like Jewel of Russia). And somehow, Balls manages both. Mildly sweet & smooth, I like the taste & mouth feel of Balls. …If they aged Balls for a good 10 years in American Oak, it’d be the best damn Whiskey outside of Kentucky. I’m gonna ramble on about the corn for just a bit longer. It’s the corn that gives Balls it’s sweet tones, vanilla notes, and smooth finish. I could mention another American Corn Vodka here, but that one has managed to distill & filter away all the corn character to achieve something very neutral. I like the fact that Balls has some taste. As you’ll note by the picture, I got my hands on some big Balls. Hey, I meant a 1.75 liter bottle. Sheesh. But apparently, size doesn’t matter. Big or small, Balls satisfies. I like the fact that Balls has some taste. Now, the vanilla I mentioned really only appears on the finish. The taste is mostly neutral with clean sweet notes. I know, it seems strange saying that Balls is clean and sweet with a vanilla finish, but jokes aside: it is. 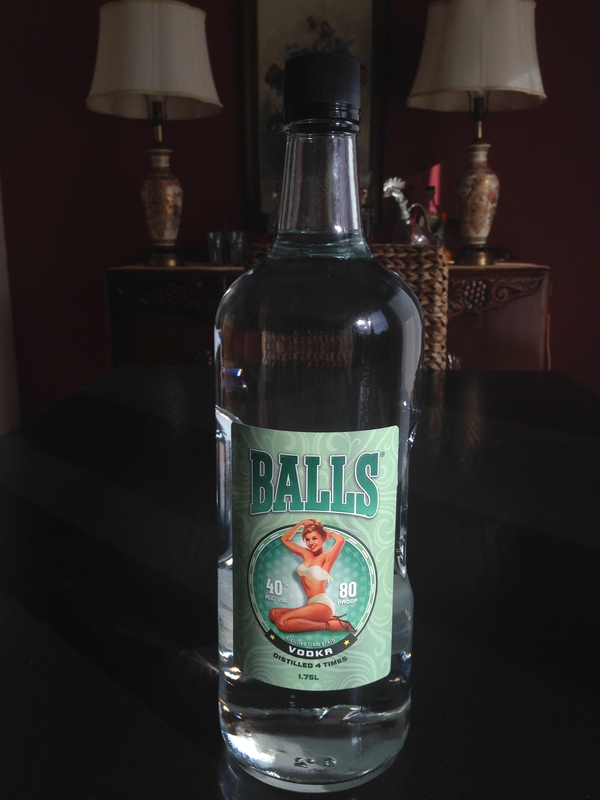 Thanks to those very specific characteristics, Balls lends itself well to being sipped straight. Personally, I like my Balls a touch chilled. The chill tames some of the astringency present on the nose, but doesn’t dull the taste. I know it’s odd thinking that the smell of Balls doesn’t match its flavor, but it’s true. The hint of vanilla on the finish lends itself well to all of the above cocktails. This is one purpose-filled vodka that will be hanging around my home bar for a long while. Got some Balls near you? Grab some. You won’t regret it.